Aaron Bauman (foreground) and Sarah Mattox depart from Plattsburg, N.Y. at 5:30 a.m.
Aaron Bauman and Sarah Mattox explore the rocky shore line of Lake Superior on June 13, 2011. Portaging to Chaumont Bay New York on July 24 along County Road 6. Southwest winds across Lake Ontario make paddling around the large peninsulas slow and possibly dangerous. 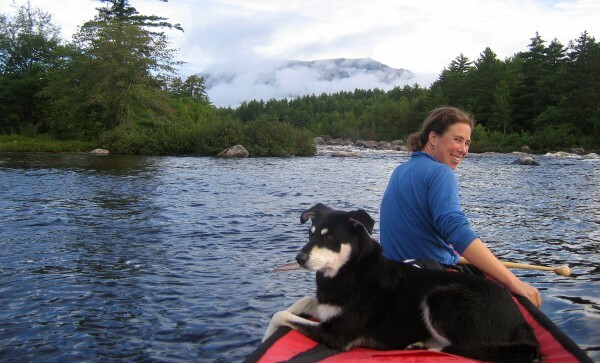 Sarah Maddox canoes with Lucky on the West Branch of the Penobscot River below the Abol Bridge in early September 2011. In the background is Mount Katahdin. Several rapids on the Black River in New York make walking from Dexter to Watertown a clear choice. Penobscot Bay near Belfast on September 15, 2011. The last moments on the water with Belfast in the background, Day 130. Aaron Bauman (foreground) and Sarah Mattox celebrate at the Sea Dog in Bangor a couple of days before completing their 130-day-long canoe journey from Ely, Minnesotta to Belfast in September of last year. 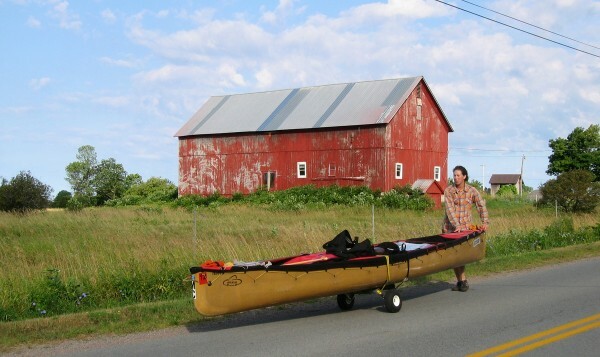 BELFAST, Maine — When Aaron Bauman was courting Sarah Mattox, he asked her if she’d like to paddle across the country with him in a canoe. Though some might be intimidated by this kind of invitation, Sarah wasn’t. “I was smitten,” she recalled this week. 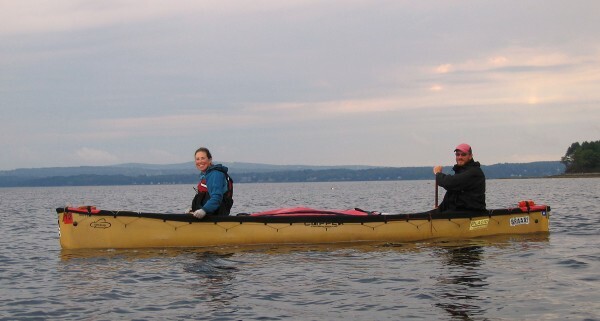 A few years later, the now-married couple have completed their second long-distance canoe paddle — a 2,200-mile jaunt from northern Minnesota all the way to Belfast. Aaron, 41, and Sarah, 32, who have settled in the midcoast city in part because it is conveniently located close to the mouth of the Penobscot River, said their journey last summer was unforgettable. “Who doesn’t want to have their own Huckleberry Finn-Tom Sawyer adventure?” Aaron asked. The trip took them 4½ months, brought them over rocky rivers and great lakes, included a brush with a hurricane, carried them past quiet forests and bustling cities, and most of all allowed them to meet many kind and interesting people along the way. 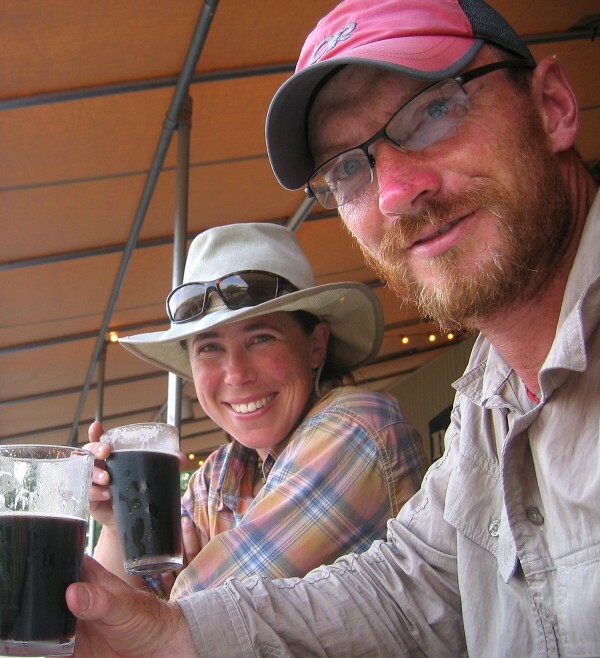 The couple met in 2002 in Ely, Minn., when both were working as Outward Bound instructors. Sarah, who is from Camden, and Aaron, from the Pacific Northwest, shared a love of wilderness and an ability to problem-solve that would come in handy on their two major canoe treks. The first, in 2005, took them more than 2,000 miles north and west from Ely to Great Slave Lake in Canada’s Northwest Territories. Last summer, they decided to go in a different direction — north and east to Maine. They wanted to make a major life change, away from Outward Bound, a national outdoor leadership program, and closer to Sarah’s family. Last May, they packed their food and gear into a 50 pound, 17½ foot canoe they affectionately call the Marriage Counselor, or the MC for short. They launched the boat in Ely, an area with lakes and forests that looks very similar to Maine. Sarah’s mom, who lives near Camden, watched their husky mix, Lucky, for most of the journey. Although they were headed in the opposite direction of the voyageurs of yesteryear, in some ways Aaron and Sarah were following in their tracks. Those long-ago adventurers used their canoes to open up the boundaries of the known world. The couple followed the path of water from Minnesota to the Atlantic Ocean. 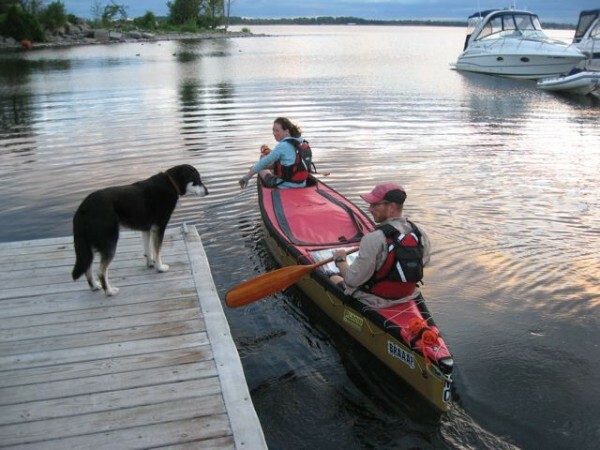 The journey carried them east along the northern edges of the Great Lakes, then across New York state, where they hopped on to the Northern Forest Canoe Trail as far as Chesuncook Lake in northern Maine. From there, they veered south along the Penobscot River, past Millinocket and Bangor to Penobscot Bay. The adventure ended last fall at the Belfast City Landing. Once in Belfast, they looked for a place to live, found an apartment close to Belfast City Park, and then found work. Sarah now works at the Restorative Justice Project of the Midcoast and Aaron is doing carpentry in the area. They keep their canoe and kayaks in the backyard and get out on the water whenever they’re able. Most days, they walk their dog in the park and check out Penobscot Bay. “We’ve called our trip ‘Paddle to the Sea,’” Aaron said. 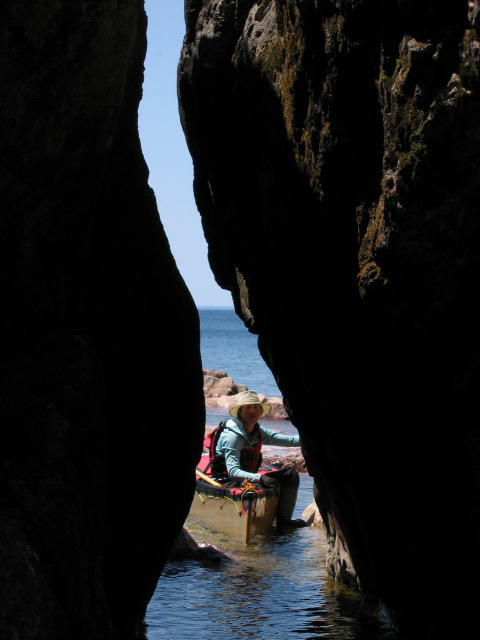 Some of the toughest paddling was in Lake Superior, where they were battered by wind and rain. They spent a couple days holed up in a cabin built as a safe haven for travelers, then put the spray deck and spray skirts on the canoe and made a mile-long crossing in the fog, “which was scary,” Aaron said. When the weather was good, they would paddle nearly 50 miles in a day. When it was bad, they sat tight, reading books and baking treats in their dutch oven. Early stretches featured a lot of wilderness camping, but when they hit civilization, they found lots of trail magic — instances where serendipitous things happen to travelers. Like the time that a man who makes movies about extreme snowmobiling let them stay in his family’s guest cabin, just east of Sault St. Marie, Ont. Or the time that the commodore of the canoe club in Kingston, Ont., picked them up in his sports car after they reached land and let them stay in his guest apartment. They talked, ate steak and drank wine into the night with the commodore and his family. Or all the moments along the way when they struck up conversations and shared a beer with people who were fascinated by their journey. 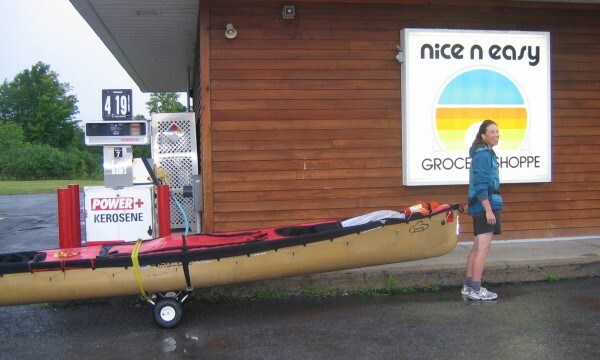 At the tiny border station in Cape Vincent, N.Y., the federal agent on duty didn’t know what to do when Aaron and Sarah pulled up in their canoe and walked up, passports in hand. Border crossings via canoe are no longer common, apparently. After being processed by the bemused border guards, Aaron and Sarah toasted their journey with bloody Marys and Ben and Jerry’s ice cream. “We were just happy to be progressing,” Aaron said. But New York state was tricky in a canoe. Some rivers were very low, while others had toxic levels of blue-green algae. Family members meeting the couple in New York state gave them a ride around most of one such river. That was just fine with Aaron and Sarah, who said that they weren’t fanatical about paddling or portaging every inch of the way. “If you paddle 2,200 miles, and you don’t paddle 200 miles, does it really matter?” Aaron asked. Once at Old Forge, N.Y., they joined the Northern Forest Canoe Trail. When they made it to Maine, they ran into some trouble on the trail while trying to get to Spencer Lake in Somerset County. The stream that normally leads to it was too low to paddle, and while trying to find an alternate route by portaging up logging roads, they were “thwarted,” Sarah said. They also ran right into the remnants of Hurricane Irene. “We walked eight to 10 hours the day that the hurricane came in,” she said. But the soggy travelers still couldn’t find a way to the lake. They camped on the side of the road, with their shivering dog, Lucky, who by this time had joined them. They covered her with an emergency blanket. The next day, they woke up to find that Spencer Stream had flooded overnight. It still was unnavigable, though for the opposite reason as before. The couple regrouped. They picked some giant blueberries for breakfast and eventually tracked down a local fellow who knew the area and was able to give them and their canoe a ride to what he thought was the correct road. “Just keep left,” he said when dropping them off at the locked gate at the head of the woods road. They did, but found themselves at a dead end after several miles of portaging. The couple backtracked and eventually did find the road to the lake. It was beautiful, they said, and their night there was one of the best of the whole trip. Then: north and east, across Moosehead Lake, through the bug-ridden forests of North East Carry, then Chesuncook Lake, where they aimed the canoe south. After portaging through Millinocket and eating lunch at Pelletier Loggers Family Restaurant, the couple was Bangor-bound. “It started feeling like the end of the trip when we got to Bangor,” Aaron said. They celebrated with a meal at Geaghan’s, where there was a moment of trail magic so powerful it’s clear the couple is still moved by it. Aaron told Sarah at dinner that he wanted to make a point of recognizing their big journey and relishing the end of the trip, because once in Belfast they’d have little fanfare. She made an excuse to get him out of the restaurant for a few minutes, clanked her glass and made an announcement to the packed dining room. “I got up the nerve to tell people we’ve been on this cross-country canoe trip for the last four months, and it was important to my husband and to me that we celebrate,” she said. When Aaron returned, he was met by a loud, sustained round of applause from the Bangor diners. Afterward, people came up to the couple, asking them how they’d done it. And they were happy to talk about their journey. It was a fitting end for a trip that more than anything had been about the conversations they had with, and the help they received from, the strangers they met along the way. “That was the most inspiring part,” Sarah said.